Is it a coincidence that the words pink and Paris both start with the same letter? 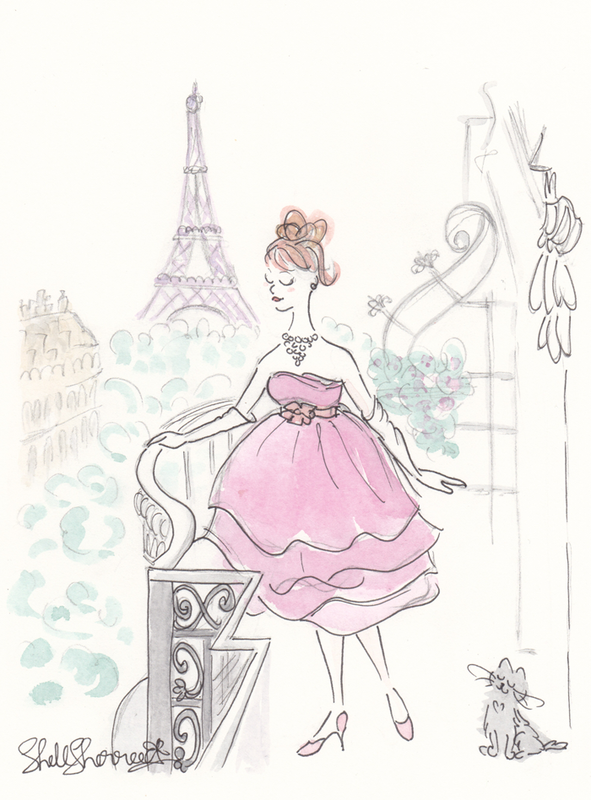 Happy Paris daydreams to you! Such a tempting invitation, and I shall be there myself in 100% pink (except for turquoise heels). Will the delightful young woman in the new header be there? She looks a bit jaded, perhaps somewhat removed from life, and it is surely our duty to show her a good time. What a pretty picture you paint (in more ways than one! ), ma petite perle. This image makes me smile—and so does the idea of a pretty-in-pink party (with pink Champagne, bien sûr). Here's to la belle Shell! Pink Champagne? You know how to make me smile, Alexa. :) Thank you, ma chère. I will maintain a respectful distance with kitty, thank you, but will still enjoy the perfect view happily dressed in pink. I'm imagining that balcony now filled with a posse of women in pink. Mise, I think the delightful young woman looks pensive, perhaps pondering her next Paris illo. Hmm ... pensive ... jaded ... little did I realise how enigmatic she is. :) A woman of mystery ~ I like it! And Susan, kitty will gladly share her spot with you. Such a delightful illustration! I'm actually less afraid of getting close to the edge than I am of wearing a strapless gown, for fear of a wardrobe mishap, but I'm definitely showing up for Alexa's pretty-in-pink party! We don't have wardrobe mishaps Chez Shell, dear Katie! Unless Hugh is there, in which case ... there could be an outbreak. She is, Ms M. She's extraordinarily good at organising, especially given she lacks opposable paw pads. Just in time for the holidays! It's always nice to see a new illustration from you. So it is! Unintentionally well-timed. :) Thanks, Petrea.